The Jeep Compass is your basic small to intermediate size SUV. Basic except for the mounting options. Lots of non-traditional design points like round vents, sloping windshield and a raised seat rail. Those design features do not typically bode well for mounting a tablet, GPS or phone. That’s a photo of the dash accompanying this article. While somewhat restricted in mounting locations, we were able to find some good locations for mounting mobile electronics. Good news is that a windshield mount will work fine for smartphone or GPS. The next place I’ll recommend my go-to mount which is the Arkon MegaGrip Suction Cup Windshield and Dash Mount. The cradle opens to 3.4 inches which is large enough for almost all phones with or without a case or skin. The suction mount features a vacuum locked suction assembly attached to a pivoting arm. The phone can swivel into any orientation. The Arkon Windshield Dash Garmin Nuvi Suction Mount works fine for all Garmin Nuvi and Drive series GPS models. The mount features a 17mm ball which fits the socket on the back of the Garmin cradles. I have recommended this one over the many years it has been available and have used it myself. It’s an excellent mount that comes with a 2-year warranty. The more is more rugged and longer than the Garmin mount received with the GPS. Both of the mounts we just discussed come with an adhesive dash disk. The adhesive disk sticks to the dash to turn the mount into a console mount. The suction assembly can adhere to the adhesive disk just like it would on a windshield. I used these on the dash of several other cars and they work great. 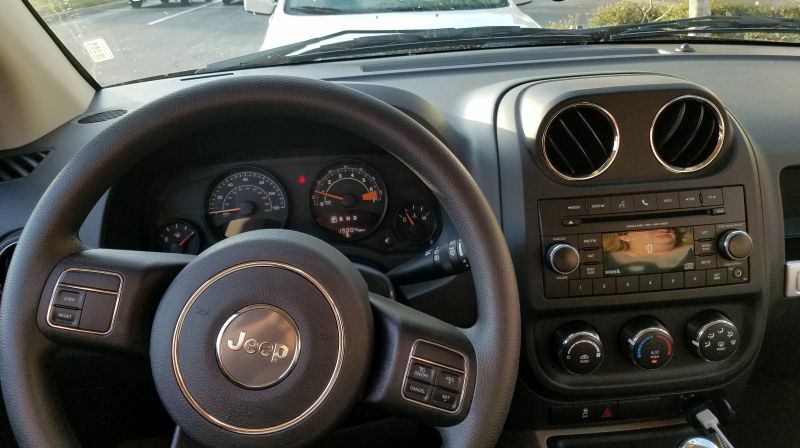 The Jeep Compass has a dash that is slightly sloped downwards toward the windshield. Seems like the best place to use this dash disk is just behind the center vents. One of my favorite places to mount a GPS or cell phone is the air vent. The Jeep Compass air vents are round and deep. The only type of vent mount that might work is one that has a tight vice grip. Vent mounts with hooks will not work on round vents. This location isn’t going to be easy so I’ll recommend passing on a vent mount for the Jeep Compass. Turns out the CD Player is a good spot for mounting a cell phone or tablet in a Jeep Compass. It’s an excellent spot for using a GPS or GPS app like Waze. Consider the Mpow CD Slot Mount for SmartPhones. This mount includes an expandable holder to grip your device from the sides or in the case of a GPS, top and bottom. The cradle opens to 3.4 inches which is large enough for most phones. A seat bolt mount is out of the question. Can’t find the seat bolts. The front seats use a raised rail and the seat bolts, while somewhere, were not easy to locate. You could bolt the mount directly to the floor but few do this as it needs to have bolts driven through the carpet into the floorboard. How about a cup holder mount? The Jeep Compass cup holders are located way down near the floor between the seats. You will not be able to see the device. The cup holders are also out of consideration. I typically add information about mounting a tablet in our vehicle specific articles. Unfortunately, there aren’t any places that I can see for safely mounting a tablet in a Jeep Compass. A nice SUV but not a lot of places to mount your stuff. The interior design rules out a lot of my go-to mounting locations. So bottom line: windshield suction mounts, CD Player mounts or perhaps an adhesive dash disk.